. . . no small feet: I'm not shy . . . I'm not shy. I mean . . . I rarely spoke during junior high, but I don't think that counts. 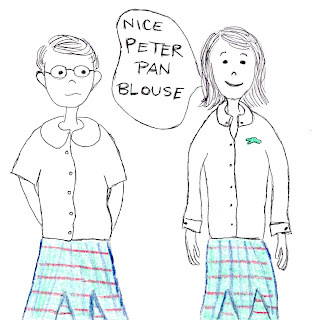 I blame my quiet phase on the fact that my school was full of snobby, preppy, wealthy kids who looked down their noses at me. 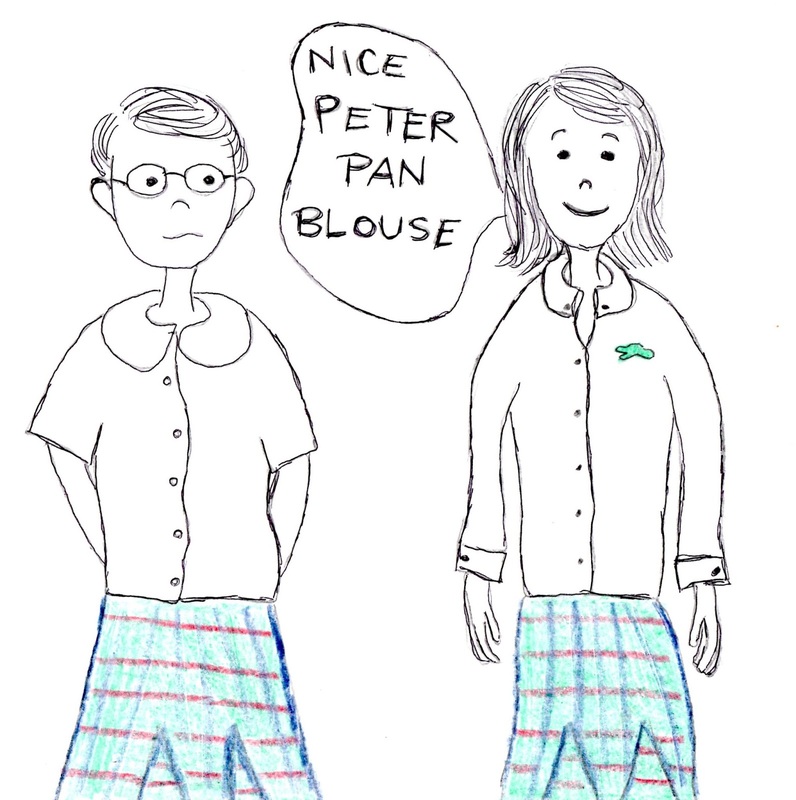 I wore hand-me-down, thin, Peter Pan-collared white uniform blouses while they sported crisp, heavy cotton, white Izod uniform blouses. I feared their sneers, so I rarely made a peep. When I hit high school, I came out of my shell. I have yet to look back, and I don't miss the safety of my shell. I don't think this sketch comes close to doing my reality justice. I stood out in a big way in grade school! I no longer fear sneers. Most of the time my outgoing approach serves me well. I make friends easily. I can chat with anyone . . . and I usually do. I've learned that being social sure beats clamming up and worrying about being judged. As a mother, I like to think my outspoken nature benefits others. 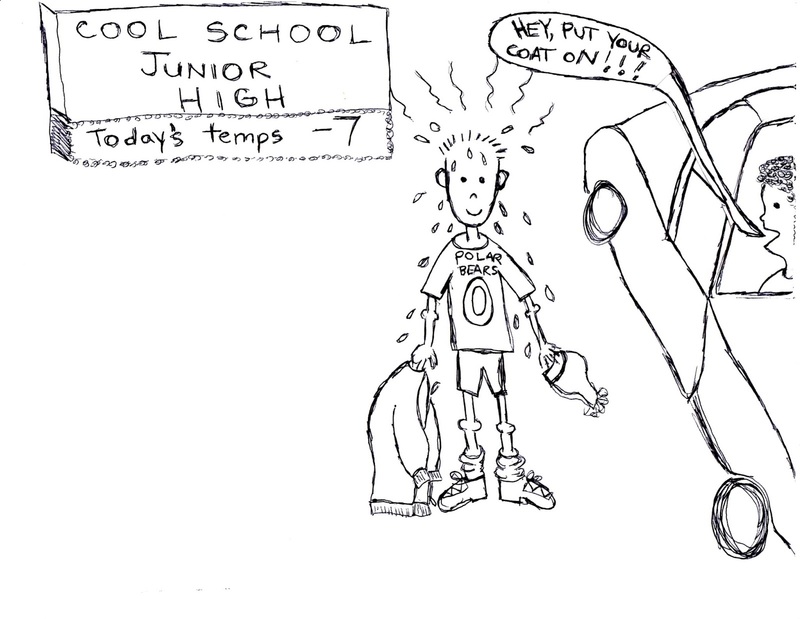 Outside my kids' junior high, I often witness sweaty kids exiting the building after a practice. 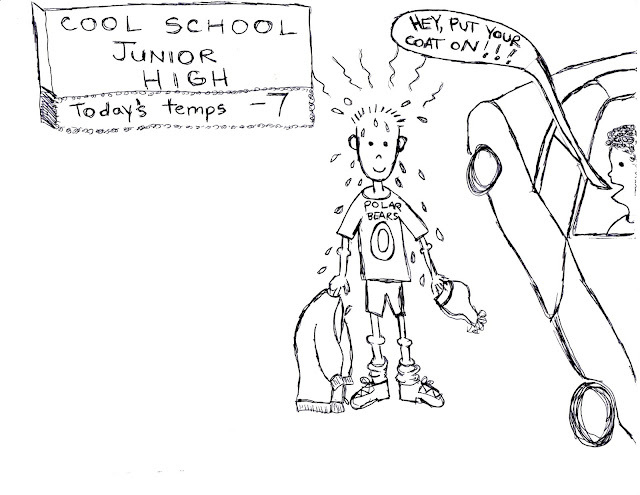 If they are cool, I mean REALLY cool, then they wait for their ride without wearing a totally necessary winter coat. This is Chicago people! I don't hesitate to instruct these kids, who like to demonstrate just how cool they are in below zero temps, to put their coat on. I am even kind enough to wait until they oblige. Meanwhile, my kids crouch down on the floor of the car for fear they will be associated with me. Back when my kids were itty bitty, I was basically corralled in the gated baby pool area of our local pool. My sole responsibility was to keep my crew afloat. Once an hour, the lifeguards at the main pool took a 15 minute break. When that whistle blew to signal adult swim, the baby pool would suddenly be overpopulated by older kids. These hoodlums chose to splash around in the baby pool despite the posted age limits. Apparently in the world of preteen boys, waiting 15 minutes to cool off in the pool was impossible. As graduates of the baby pool, the mothers of these rascals focused less on their offspring and more on conversations with friends, reading magazines, or sunbathing. Part of me was jealous of these mothers and their freedom, but the other part of me thought 'What the Hell?' The tidal wave their unsupervised kids created in the one foot pool left this once safe arena a tad dangerous. In the absence of parental controls, I stepped in to give orders. I didn't hesitate to instruct them out of the baby pool. Sometimes I demanded that they release the little kids' toys from their destructive big-kid hands. No fear, little local pool, Ernie has it covered. The scope of my bossiness isn't limited to winter coats and rule-breaking preteens. I've scolded teen drivers for their reckless abandon while behind the wheel. I once followed a kid thru my neighborhood to point out that the stop sign he ignored outside our home was in deed official -not just there for show. Am I alone in my willingness to rid the world of naughty, disruptive, and dangerous kids? Do you ever feel compelled to step in and correct someone else's kid? I'm not a Hillary follower (please don't count that as a politically charged statement - I'm not about to debate politics here, or anywhere for that matter), but I guess I do subscribe to the 'It takes a Village' mentality. There is a reason I'm describing my corrective nature. I've shared this info with you now, so that you can appreciate my latest encounter . . . coming soon, in my next post.